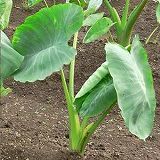 The aroid (taro) is a plant of for food of the aroid department. It is an origin of tropical Indonesia. The underground portion of the stalk (tuber) is usually assumed to be for food. Moreover, it is said that the stalk is also [zuiki] and becomes for food. It is a dasheen kind of companion who it is the tropics, Southeast Asia, and is staple food. It is old and Jomon Period that introduced from Southeast Asia to Japan. The name of taro seems to have been given from cultivation in the hometown compared with the yam. It is possible to grow it comparatively easily if juicy and getting much sunlight with the clay-rich soil. It digs in around autumn, it takes, and it harvests. Cooking is generally used well as a material of the boiled food. The daughter tuber and the secondary tuber are the good luck talismans of the descendant prosperity in the surroundings because it can do a lot with a big mother corm. The dietary fiber of the aroid is abundant in low calorie content. There is a digestive promotion action in the mucin of the nutritional content. Moreover, the immunity improvement acts in the galactans. Because there is a harsh taste in the life, and bitter is strong, it is not possible to usually eat by the life. The protein is changed in quality heating it and bitter is taken. The aroid is easy-to-use to the boiled food. It is possible to use it for any boiled food if it devises it. The taro takes slime washing in water after it cuts in the size that eats easily and it massages it with the salt. It puts in the heat-resistant container, and Dashi-soup and the miso are twined with the mirin. It wraps and it heats it with microwave oven for about one and a half minutes. After this is taken out once and the boiling soup is twined, it heats it with microwave oven for about 30 seconds further. The skin is peeled off and the taro is cut in the unit size. The Atsuage is cut in the size that eats easily after dropping oil sprinkling the hot water. After it boils it with the hot water that puts the salt, the snap bean is sliced. Sesame oil and ginger are heated by the medium flame, and the taro and the Atsuage are stir-fried to the pan. When oil takes effect to the whole, Dashi-soup is added. The drop lid is done, the fire is weakened a little, and it boils for 15-20 minutes when boiling again and leaving. It boils until the lid is taken, the fire is strengthened, and moisture decreases. The snap bean is dispersed after it piles it up in the container and the completion. If the taro is washed in bare-handed, the hand becomes itchy. This is because the oxalic acid calcium is contained in the potato etc. in crystal condition. Therefore, it is necessary to devise it to wash the potato. To remove the skin together washing the aroid, the aroid in the state of the skin's adhering is put in the bucket and water is put in. It turns right and left the thrust of a suitable board. Then, the aroid rubs mutually and the skin peels off easily. I put the aroid in the container of a cylinder tree that adhered the runner in childhood, it took to the river, it turned like the water mill, and it washed. The skin had peeled off beautifully when putting it as it is for a while in the river. It is an interesting way. The aroid is boiled with the pan for 2-3 minutes like the skin though the hand is a little hot. The skin can be peeled off by suppressing it with the kitchen paper etc. with hot.